A quick and accurate determination of the physical properties of seawater represents an important aspect of research dealing with processes that involve wide variations in temperature, pressure, and concentration. The physical data should be cast in a form readily compatible with the development of mathematical models associated with the synthesis and optimization of industrial processes involving heat and mass transfer operations on seawater. In this work, previously reported experimental data pertaining to the variation of seawater physical properties are correlated into simple empirical mathematical forms enabling their straight forward inclusion into mathematical models associated with seawater and brackish water desalination. Modeling is one of the methods used to solve practical hydrogeological problems associated with movement and assessment of groundwater sources. It is has long been in place in hydrogeology with the first well-described modeling methods dating back to the beginning of the 20th century. Analog and digital techniques advancements in the late sixties made it possible to apply them more actively. Nowadays it is unthinkable to address such type of scientific problems without the use of contemporary software tools for geological and hydrogeological modeling. Coupled with modules used in GIS media such tools enable resolution of specific tasks aiming to describe underground filtration flow. Combing innovative technologies for a detailed three-dimensional reconstruction (approximation) of a geological medium with detailed calculation procedures for a mathematical description of groundwater flow in such medium enable solving a wide spectrum of hydrogeological tasks of great complexity. Numerous are the research institutes, universities and private organization worldwide that focus on developing contemporary software products for mathematic modeling. Specialized modules are designed to support hydrogeological surveys. The products developed operate on a very high level input data automation, graphic interface, visualization, etc. Some of the companies employ MODFLOW which is one of the most frequently used computer codes in groundwater flow modeling. It is module-type software based on the finite difference methods, and has been created by US Geological Survey McDonald and Harbaugh (USGS) , the output code being free software. The approach employed in the case presented involves calculations and 3D visualization by means of our own simplified software (VISMAT) developed on the grounds of modern software and hardware solutions in combination with numerical methods. Part of MODFLOW code is also used in VISMAT development. A mathematical model has been derived to assess the potential of the rail passenger transport to increase his capacity and efficiency. This potential has been evaluates in comparison with the competition of the bus transportation. A specific transportation route has been chosen from Sofia to Varna and the potential for increase of the rail transport has been evaluated. The mathematical model uses optimization problem, related to the evaluation of a maximal flow in a transportation network. We present the experimental technology of full red mud recycling by the method of reduction roasting with calcium carbonate added into the raw mixture, which allows obtaining the iron-bearing concentrate with minimal impurities. The technology also includes the raw milling and magnetic phase separation. The silicate part resulting from the magnetic separation is roasted with some additives to the valuable cement clinker. At the end of recycling we get full red mud utilization and two valuable products – iron-bearing concentrate and cement clinker. Being at the crossroads of Europe and Asia, Kazakhstan has significant transit potential, providing Asian countries transport link to Russia and Europe. This paper propose creation of new transport corridors on the territory of the Republic of Kazakhstan, allowing to organize the transport of bulk goods by railways from the European Union, followed by railways of the Republic of Kazakhstan with access through the territory of the Islamic Republic of Iran to the Persian Gulf, that reduces the time of delivery. At the same time, forming a new transport corridor linking the Islamic Republic of Iran through the Railways of the Republic of Kazakhstan with the railways of the People’s Republic of China by ground transport, in addition it provides an output of Iranian goods through the port of Lianyungang to the "big water". This will allow transportation of goods and services to the states of South-East Asia (South Korea, North Korea, Malaysia, Philippines, Australia). Organizational management in the social sector includes several main functions and the motivation is one of them. It can influence the success of the company negatively or positively, therefore it takes an important role. Motivation is based on various types of needs arranged in those models, approaches and theories. The multiple attempts to explain it have not come up to a single scientific explanation that is equally suitable for all organizations. Furthermore, the needs of motivation change due to factors like the dynamic environment in which companies today function. The globalization also produces new opportunities and risks for the motivation. The current material will attempt to collect and compare various motivational theories, and present some existing issues. Although there are similarities between the works of scientists in this direction, so far there is no universally applied guide for managers. Considering the changing needs of the management in terms of motivating their personnel, it is necessary to explore what problems are present in the motivation and search for possible solutions for them. The report is an attempt to classify different factors and their impact on the competitive potential of the company. An attempt to find a link between competitive potential, realization of investment projects and financial potential. Significant impact on the growth of competitive potential has financial potential. 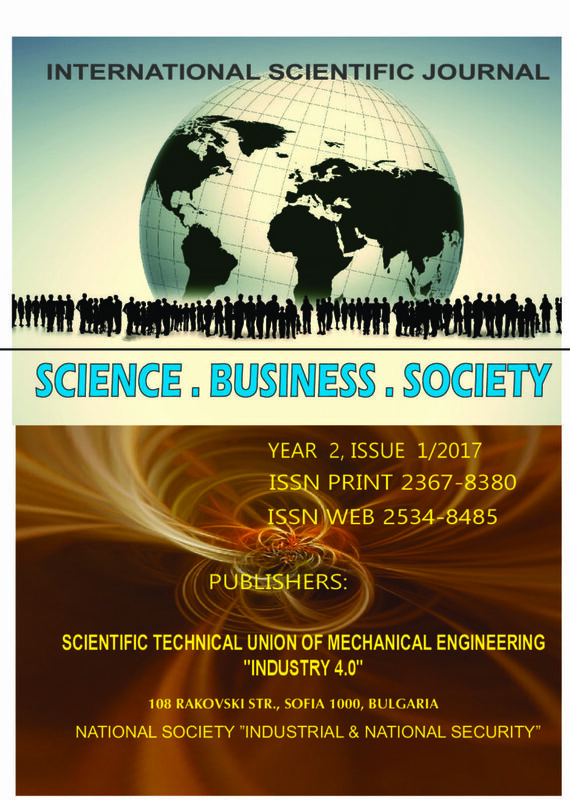 In the article examines the theory of the life cycle of industrial enterprises and the possibilities for its use to solve the problems at any time. The report examines the management issues of the innovation potential of industrial enterprise. The main components of the innovation potential as an economic category are investigated and recommendations to evaluate innovation potential are proposed. In the following report are shown the main criteria for development of a Technical documentation for a medical device according to Council Directive 93/42/EEC. A general approach is presented as a result of a systematisation of the requirements of the European technical legislation. This approach can be used as a base for developing the technical documentation of all classes of medical devices.